One year ago, I was in the beginning of my second trimester. I was thrilled to be feeling my sweet baby move inside me and was loving having a big belly forming that I couldn't keep my hands off of. 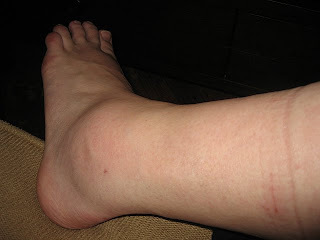 But, alas, I also had another large round swelling on my poor body. 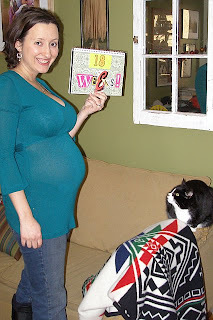 After leaving my OBGYN's office one afternoon, my husband and I were crossing the street and I slipped on ice and (lest I hurt the precious bundle held in my belly by falling all the way down) tried desperately to right myself...which only resulted in me taking three or four giant, awkward, painful steps after the initial crunch. YUCK! And these were taken over a week after the initial injury! I don't recommend getting injured while pregnant for many obvious reasons: one is that they can't do any major testing (no x-rays, no MRIs, etc.) and another is that you can't take any good pain killers (they say you can take Tylenol, but I didn't take that either because the thought of sucking down chemicals that my baby didn't need made me uncomfortable). 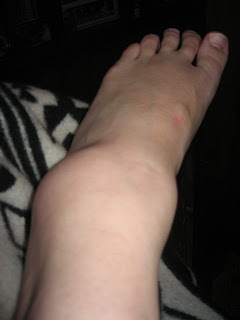 Moreover, I really don't recommend getting injured while pregnant in New York City! It's hard enough to be pregnant in a town where you lug your new-found weight up and down flights of stairs in the subway stations, ride to and from work standing up shoulder-to-shoulder with strangers, and pound the pavement constantly...but going through my entire second trimester with a "boot" up to my knee, having to slip away from work to go to physical therapy three times a week, and trudging up and down the stairs of my third-floor walkup every day was ridiculous. 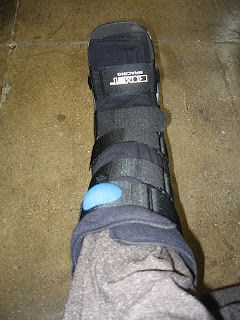 It took over two months before the swelling went entirely down (I had apparently torn a number of ligaments in my ankle) and I could walk normally in a regular shoe. My poor ankle still clicks when I walk these days, but overall it's fine. Just one of the many things I can chalk up to the whole idea of "it-was-all-worth-it-because-Ruby-is-amazing!" There sure are a lot of those things...that must just mean that Ruby is extra amazing!